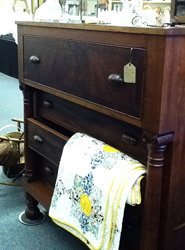 Early Southern Cherry 5-drawer chest, circa 1795-1810. Graduated drawers, beautiful surface, original hardware. Measures 3 ft 9 in tall x 3 ft 6 in wide. 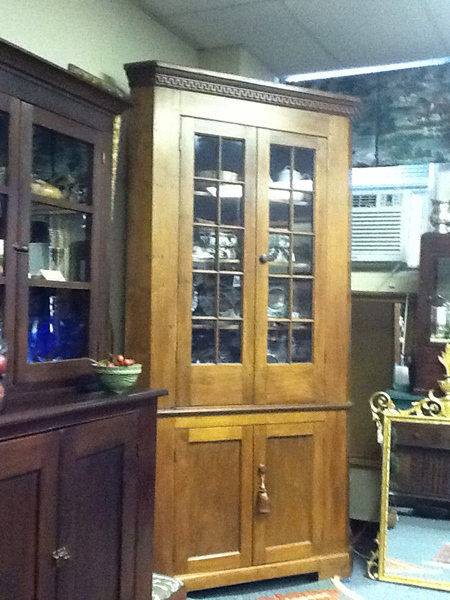 Kentucky 8 ft 20-pane corner cupboard circa 1800-1820 with butterfly shelves/dentil moulding. 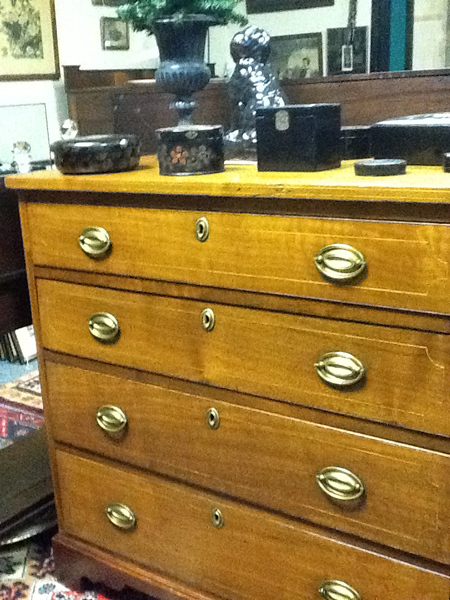 Kentucky 4-drawer oak chest on stand with rare heavy oak drawers. Beautiful inlay detail, circa 1790. Measures 37" wide x 36 in talk, 18" deep. 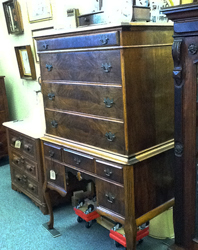 Highboy chest with 9 walnut veneered drawers and Queen Anne front legs. Dovetailed drawers with oak interior. Measures 36 in wide, 19.75 in deep, 58.75 in tall. 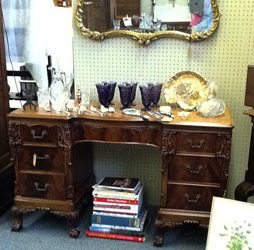 Ornate mahogany desk with mahogany flame veneer drawers. Measures 52.75 inches wide, 20 inches deep, 30 inches tall. 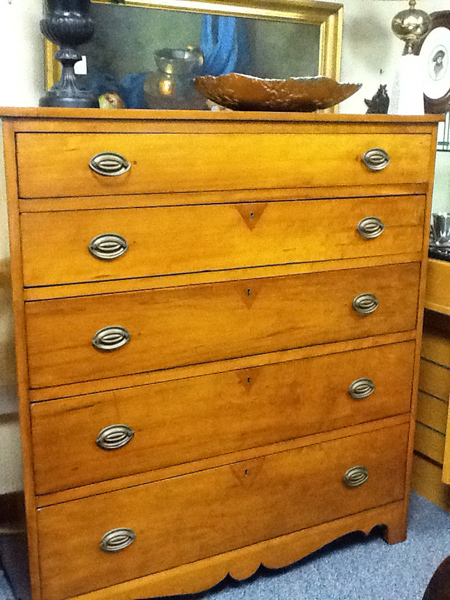 Newer mahogany tallboy chest on chest with 12 drawers. Measures 42.5 inches wide, 22 inches deep, 81.75 inches tall, solid wood, no veneers. 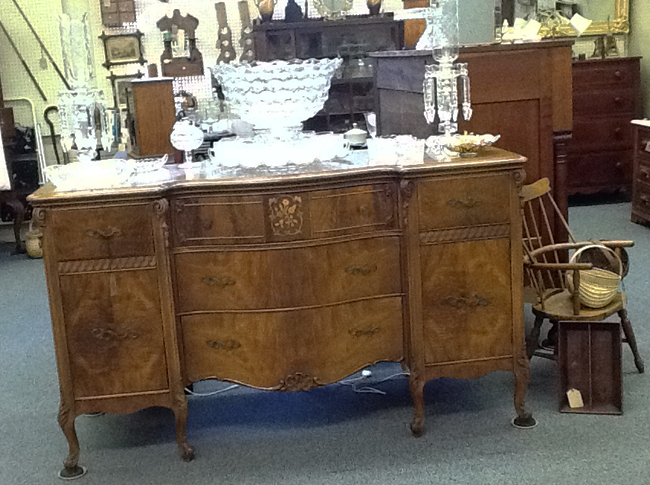 French Provincial sideboard, highly digital walnut veneers on drawer fronts, measures 62 inches wide, 22 inches deep, 36 inches tall. 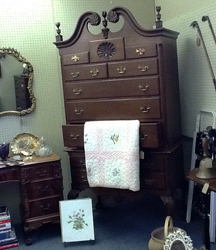 *Contact Jean Allen at (859) 255-7309 or email jeanallen@antiqueskentucky.com.